Tomorrow will be one year since Dale died. It seems impossible to me. I had a tree planted and a memorial plaque in his memory that finally were installed yesterday at a local plaza in the town where I live. In preparation for this important anniversary, I "circled the wagons" I am having a small private dedication with my closest friends, followed by dinner. My granddaughters are coming for a sleepover so I won't have to be alone. With all my planning, I will still be glad when it is over. Today is one year since my husband died. This has been quite a journey, with some very unexpected twists and turns. "alone" does not have to be synonymous with "lonely"
getting through all the "firsts" seems impossible, but you somehow get through it-I hope the "seconds" won't be so tough. planning ahead helps. Excerpted from thegriefblog.com, here’s a man’s perspective on losing his wife. You’ve been with her for many years. You have shared the ups and downs, the tragedies and the triumphs. You became used to each other and shared your dreams, the dreams you both had, with bright eyes and wondrous anticipation when you were young. . . . And then one day, she was gone. Just that fast, she was gone. You didn’t have a chance to say goodbye, or tell her what she meant to you, or ask her what you will do without her. She was just . . . gone. You walk through the house and find her here and there, the lamp you both argued about, but she let you win; her favorite, cracked cup that she glued back together so carefully; little things, a million memories, and you wonder how you will go on. It’s too quiet now. No one there to say, “Hi Babe; how was your day?” Just the mocking silence. Why is the pain so unbearable? What is it with life anyway? Does it all come down to this; this crushing loneliness? Will there ever be another? No, there couldn’t be, not like that one. You could never let yourself fall so deeply in love again, it’s too painful. The days go by, and the memories fade, and you find that you are changing. You will never be what you once were. The youthful exuberance and the never ending optimism has been replaced by a deep sadness, a melancholy wisdom, and you find yourself slowing down a little; nowhere important to go now, now that the one you lived for is gone. You find yourself going through the motions. And one day you think about her less often, but when you do, you still wonder if you could have made her happier, if you could have sacrificed a little more or paid more attention to her little dreams, instead of just what you wanted. But then you remember -she never asked for that much, just to be with you. You’re moving on now; you can’t live in the past. The world does not stop spinning. You know that she is okay, wherever she is; she always had a way of making the best of things. But you’re not okay, not really — maybe someday, but not today. And you sit with the loneliness, and the pain; and you don’t escape from it this time. You don’t escape into a therapy of some kind, or a self-help book. No, you sit with it, and it takes every bit or courage that you have, and you feel defeated. There is no more hatred toward others, no more criticism. There is no energy for that. They will feel this same pain someday, and therefore how could you not feel connected to them? There is no longer any self-righteousness, because you no longer know anything about life for certain, all of your certainties died with her. Now you are experiencing life, raw life, just as it is, without hiding from it, or theorizing about it, and somewhere deep inside, mixed in with all the pain and the hurt, there is a murmur, just a whisper of something else. And you sit at night, alone in your meditation; your breath going in and going out, your memories and the pain going in and going out. The moonlight drifts through your window, your only friend now, and after awhile, it’s okay. It’s quiet now. If you listen carefully you can almost hear her breathing next to you, and you continue sitting in your meditation. And you hold your broken heart in your hands . . . and you ask why. No answers come, just the in breath, and the out breath, and the cycles of life where everything changes, and where we suffer so much. And that is enough for now. And you sit with it. And you wait . . .
Back in '09, Contributor Deb Edwards shared her reflections in this insightful post. Anyone who has lost their partner knows what I am referring to in some way. It is how you feel when you are the only one in the room that is not half of a couple, It is the way you feel at the end of the day when you are alone. It is the way you feel the first time you fill out a form and circle the “W” instead of the “M”. It is the way you feel when you realize they are never coming back. Since my husband died a little over a year ago, I have felt a physical and emotional “hole” where he used to be. It is bigger on some days and smaller on others, but it never goes away completely. I have known people that have used the “hole” to engage in self-destructive behaviors. Eating too much, drinking too much, self-medicating, spending too much, but at the end of the day, the “hole” is still there. I tried to fill the “hole” with cookies, but trust me - it didn’t help. The “hole” was still there - and I had a stomach ache! So what do you do? You do the best you can to fill the “hole”. Meet new people, find new interests, and develop a good support system. Re-invent yourself - take risks-step outside your comfort zone. I am fortunate to have a job that I love, I spend time with my grandkids, I rescued a cat and I have been doing volunteer work. Don’t hesitate to get professional help if you feel like you have fallen in the “hole” and get can’t pull yourself out. The “hole” is a normal part of the grieving process and nothing can ever replace the one you lost. It is ever-present, but what I have learned during the past year is that it is how you fill the “hole” that is important. You have a choice every hour of every day on how you want to live your life. So choose well, but don’t beat yourself up. We are human, and some days we do better than others. And as always - breathe! * May you have the hindsight to know where you've been, the foresight to know where you're going and the insight to know when you're going too far. * A friend's eye is a good mirror. *Even a small thorn causes festering. * When a twig grows hard it is difficult to twist it. Every beginning is weak. * As you slide down the banisters of life may the splinters never point the wrong way. * May your troubles be as few and as far apart as my Grandmothers teeth. Here are more sayings from our book, Lost My Partner – What’ll I Do? 1) For now, it’s okay to ask for help from others. Nobody’s strong all the time. Even Superman can be weakened by Krytonite. 2) Confusion and memory loss are normal and temporary symptoms. 3) The first year is full of first everythings. 4) Any new situation will start out being uncomfortable the first time. The next time is always easier. 5) Bereavement is a learning experience about you. You’ll discover new capabilities and strengths you didn’t realize you had. Here are some collected "words of wisdom" excerpted from our book, Lost My Partner – What’ll I Do? Revised and Expanded Edition (learn more). These gentle reassurances can be printed out and carried with you for those moments when you need a little boost of support. - It does get better. The pain will soften with time. - Every tear helps. The best way to get through mourning is to do the grieving. - You will mourn in your own way and in your own time.- For now, not normal is normal. - Most of your whole world has been turned upside down. Be gentle with yourself. While in the process of setting up this blog, we were contacted by Deb Edwards, a visitor to our lostmypartner.com website. We recently heard from Deb and were inspired to again share some of her original posts. Life does go on...but never the same way. Take care of yourself...and remember to breathe. In Part 2 of our excerpts from Lost My Partner – What’ll I Do? we looked at the changes in dating customs that may have occurred since you were last single. Okay, now you’re ready to start easing your way into the social life of a single person. How exactly should you go about it? Your attitude in approaching this step is important. Try to think in terms of a shopping experience. You’ll want to “try on” the different ways and places to meet someone until you find a good “fit”. In the process, you’ll get a chance to learn what doesn’t fit or appeal to you. - If you’re comfortable with it, let friends and family know you’re ready to meet new people. - Find a friend who’s currently single. Ask this friend for advice about the latest rules and customs. But remember: no matter how well-intentioned advice can be, you always need to adapt it to what feels right for you. - Check out social activities geared for singles at your place of worship. - Check local papers or online for schedules of special-interest activities for singles. Many feel more relaxed when there’s an activity such as hiking, films, gourmet cooking, concerts, etc., to focus on rather than just “meeting someone”. If you’re over fifty-five, consider joining Elderhostel, an organization that combines travel with learning in a way that’s comfortable for people on their own. - Bring a friend along the first time you try anything new. It’s a good idea to discuss before you go what each of you will do in the event one of you becomes uneasy, wants to leave early, or meets someone. Trust yourself to know when it’s time to start dating. That doesn’t mean you won’t be anxious or uncertain. Some anxiety on any date is natural and, in your situation, expected. Don’t try to bluff it out. What often helps is to let the other person know that you’re new at this. One of the most important things to remember in starting any new relationship is that a new person is a new learning experience. You probably had years to get to know your spouse/partner and adjust to the ways you reacted to each other. A new person can’t be expected to react in the same ways as your spouse/partner did. It takes time to know each other. A WORD OF WARNING: Sometimes people jump into dating to erase the pain they’re feeling. They hope the excitement of a new relationship will make the pain go away. Dating for that reason can backfire. You aren’t being fair to a new relationship when you haven’t taken enough time to emotionally finish with the old one. Please take the necessary time to go through the mourning process before you start dating. Please share your thoughts about these posts with us. Join us as we mark a decade (!) of offering support and sharing the struggles and personal triumphs of those of you surviving the death of a partner. All month, we'll post our own favorite "Words of Wisdom" as well as the personal insights that visitors have shared with us. We continue to be touched by and appreciative of your ongoing interest in and support for this blog and our book, Lost My Partner. So thank you, friends. And please stay in touch! Unfortunately, it’s an all too familiar situation when your spouse/partner has died and a relative, friend or acquaintance appears, phones or emails you. In their well-meaning way, this person offers what they consider to be heartfelt and comforting words of condolence. Unfortunately, these remarks come across to you as being incredibly insensitive, presumptuous or just plain clueless. Any of these sound familiar? For more a more extensive list of clueless condolences, check out WidowNet.org. It's a site with other helpful information for widowed men and women. Got more remarks that have left you seething? Just click onto “Comments” and let’s hear ‘em! Ever had a divorced person say to you, “I know just how you feel. When my marriage broke up, it felt just like a death had happened.”? Although usually well-meaning, these sorts of remarks can really tick you off! The assumption that surviving divorce and death present similar traumas is certainly understandable. The “death” of a marriage can bring about intense emotional pain and grief. Indeed, a mourning process usually occurs in many divorces in which each partner grieves for a multitude of losses, from emotional to financial. However, what some people have trouble understanding is the fact that while divorce, however painful, is basically a choice, death is not. In a divorce situation, you may wish your ex-spouse was no longer around, but he or she is, in reality, somewhere out there. Still alive. Death, as we say, is final. In Part 2 of these excerpts from our book Lost My Partner – What’ll I Do?, we discussed ways to know when your period of mourning is over. Try to remember the time before you had a partner. Think about what you were like and how it felt to do things on your own. 1) What dreams and ambitions were set aside because of marriage and its responsibilities? 2) Did you used to adapt to changes more easily? Now that you have the wisdom and experience you lacked at an earlier age, can you see how your abilities have grown and developed with time? when will this be over? part 1: how long will i be in mourning? 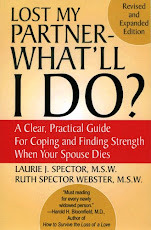 (Excerpted from our book, Lost My Partner – What’ll I Do? Revised and Expanded Edition). The mourning process is often described as feeling as though you’re stuck on a roller-coaster. Nobody chooses this ride, but once it starts, you have to hold on tight and trust you’ll eventually be back on solid ground. The first few dips can be unsettling, and just when the track straightens out and you think you can finally relax, there may be a few more dips before you get to the finish. The hopeful news is, if you don’t try to jump out before the ride ends, and if you have someone (or a group) beside you for support, the dips will come less frequently, and you’ll recover more quickly. In most cultures of the world, the period of mourning is traditionally one year, however, the answer is different for everyone. 1) Whether your spouse/partner’s death was sudden or expected and the circumstances of his/her death. An expected death generally gives you time to do some anticipatory grieving. A death caused by sudden and/or unusual circumstances will take longer to mourn, because there was no chance to prepare for the loss. 2) The emotional climate of your relationship with your spouse/partner. Troubled marriages tend to take longer to mourn. 3) How you’ve mourned previous losses in your life. 4) The ways you’ve observed family members mourn, which gave you (rightly or wrongly) a model of how to grieve. Was it important to appear “strong” and unemotional? 5) Whether you’ve lost anyone else recently. You may feel overwhelmed by “still another loss. In part 2, we’ll offer ways to know when your mourning period is winding down. If you have a pet(s), you may have noticed changes in their behavior since your spouse/partner has died. We came across the following post by on the Animal Friends site and found it interesting. According to When Pets Grieve, "We all find it hard to say goodbye. Our pets are just like us in many ways. Many of us can clearly understand their moods and emotions by the way they look at us or the way they wag their tail. Our pets display emotions every day, but do they experience a complex emotion like grief? Grief is a reaction to the sudden absence of something or someone who brought comfort and satisfaction—and many pet owners will attest that their pets grieve when they lose a loved one." It continues, "Research now confirms that our pets experience symptoms of grief when they lose a beloved human or animal companion. Grief has even been observed in wild species. Elephants have been seen caressing the body of a deceased companion. There are published reports of pets who constantly search for a deceased loved one and animals who no longer want to play or eat when a companion dies." The author goes on, "Many grieving dogs often act as if they’re searching for something. They become restless or lethargic, lose their appetite, have accidents in the house, cry and don’t want to play. Dogs are certainly not alone; many cat and rabbit owners report similar experiences with their grieving pets." The author suggests, "Just as you’d comfort a grieving friend, you can help your pet cope with grief. First and foremost, keep your pet’s routine as normal as possible. This may be difficult if a pet’s primary caregiver has passed away, but it is essential to maintain as normal a routine as possible. Second, don’t reinforce any behavioral changes. If your pet stops eating, don’t change the food, and don’t increase the amount of attention you give your pet. It may lead to new problems, like separation anxiety." And goes on to advise, "If you find that nothing helps your pet, speak with your veterinarian. Your vet can help you decide whether prescription medicine will be effective to help calm and relax your pet." The post later concludes, "Both humans and animals find it hard to say goodbye, but with love and understanding, we can work to help our animal friends cope with loss." The holidays are finally over. Congratulate yourself on having survived. As you look ahead to the coming year, what do you feel? Dread, anticipation or a combination of both? 1) This will be a year of firsts, i.e., first birthday, wedding anniversary, and/or other special occasions since the loss. 2) You are wondering where to turn for support. - Think about ways to enlarge your circle of friends, (you may have lost some, especially couple friends, now that you are widowed). - Re-define how you see yourself. What strengths have you gained and in what ways are you more confident? - Consider trying new activities, which are good ways to gain both of the above. Recognize that while so much in your life has changed due to your loss, you can trust yourself to learn how to weather the changes and challenges in the year ahead. In our next post, we’ll suggest 5 easy and practical resolutions you can make for the coming year. Give yourself a big pat on the back! You’ve just survived the holidays, one of the toughest times for anyone grieving a loss. Now you’re probably looking ahead and wondering how you’ll ever make it through the next twelve months. 1. Remember to keep any resolutions realistic. You’re not your usual self while you’re grieving, so be gentle with yourself. 2. Set at least one small, “bite-size” goal every day, such as tackling a couple of tasks. Be sure to reward yourself after each effort. 3. Think back to the person you were before you married. Can you remember any hobbies or interests that you might have set aside due to family responsibilities? Consider participating in those former activities once again. Local adult schools or community groups offer many opportunities to freshen up your skills. 4. Reach out to others more often. Make a new friend. While widowed groups offer the chance to meet others who can relate to what you’re going through, there are opportunities in your neighborhood such as clubs and organizations that can also be great sources for meeting people who may share other interests with you. 5. Consider all the self-imposed barriers you’ve put up over the years about what you can and can’t do. Now is the time to confront those old beliefs about yourself. Slowly begin to tackle a few of the things your spouse used to handle, such as minor household repairs or cooking. If you can put even one of the above resolutions into action, you’ll be giving yourself the gift of greater self-confidence with which to face the new year.